As a kid, I used to hate the word “snack”. I don’t know what it was, but it always made me scowl and cringe with embarassment. Maybe because everyone who said “snack” ended up sounding like a big ol’ whiner (“snnnaaaaaaaaaaaack”) that it totally drove me up the wall. But times change and pretty much everything about “snack” just seems right. It’s true that I love it for it’s by-gone day notions…somehow it conjures up family rec rooms and wood paneling and the colours avocado and orange. Snack time and snack break and even “Snackin’ Cake” (a commercial cake mix) totally makes me think of being a kid in the ’70s. Earlier this week, I was on a snack mission. I wanted something sweet (but not overly so) and easy to make with no muss or fuss. This square is very similar to a brownie in texture, so I guess this is what could be termed a “blondie”? It’s dense and chewy and the edges got a bit crispy which is just how I like ’em. Cornelius couldn’t get enough of them! And for my snack quota? Totally fulfilled. 1. In a large mixing bowl, combine sugar, butter, egg and vanilla until smooth. Add in flour, baking powder and salt and beat until combined. Add in chocolate chips and walnuts. 2. Grease up a square baking pan and add batter to the pan. Smooth out tops and bake in a 350 degree oven for 25 minutes or until the top is golden brown. Here’s to being a kid in the 70’s!! Shazam! Electra Woman and Dyna Girl! The Bionic Woman! This snack cake looks divine. Gotta have me some of that when I recover. I ate at a restaurant so I have been lying low. I saw the recipe for these and immediately knew that we had to have them for dessert tonight. I substituted almonds instead of walnuts because that was what we had, but they still came out great! We call these Blondies, though I think I pack the sugar which makes them a bit sweeter and I usually sprinkle the choc chips on the top. They are the best. I almost always have every ingredient in the house. An extra level of decadence though, is to eat them with a good vanilla ice cream and even a little caramel and choc. syrup. Not a snack anymore but a very rich dessert. joanne, recover quickly and make this immediately! lobstersquad, yes, make this! it’s so easy and tasty delicious! jinger, glad you tried this. almonds would be so good in this! bethany, i was afraid they’d be too sweet if i packed the sugar, so i just let it loose 🙂 eating these with vanilla ice cream would be dreamy! yum. yummmmmmmm…but i still haven’t made your strawberry muffins, and i have a birthday cake to make! you and your appealing recipes. this will be printed out for future use. Mmmmm! I love these. They look fantastic! thanks kristen, these are pretty delicious! I would love to snack on that right now – it looks so delicious! Ooooh I think I am gong to bake these tonight. My boy loves chewy soft cookies; this may be right up his alley. I think I am going to sub some peanut butter chips for the walnuts though — he doesn’t like his snacks *too* healthy. 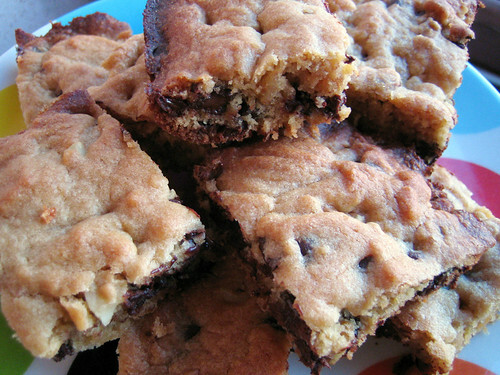 I made these last night, and followed the recipe pretty closely…well, except for the extra chocolate chips that I added! I think the next time I try it, I’ll try to work with a little less butter, since this was a little too heavy and rich for my taste. Overall though, I think that these are awesome. ooo blondies. yummy. Haven’t made these in ages. I want to know what happened to the Snackin’ Cake mixes. What company made them and are they available any longer? Who was the maker of "Snackin Cake" and why did they stop making it? My kids could make it all by themselves and they were really good. I think they need to make a reappearance. I loved Snackin Cakes. Does anyone remember who was the maker? And why did they stop making them? They were so simple my kids could make them by themselves and they were good! I think they need to make a reappearance. Does anyone else agree?